Puff and I were taking an early morning look out of our window only to be greeted by yet another rainy day. . .
Me: I dunno, Puff. It’s pretty cloudy outside today. P: It does. It looks like its raining. . .and its LEAFING, too! I am SUPER JUMPING GIRL! While we were playing kick-the-ball outside yesterday morning, Puff decided to take a break and roll the ball for a little while instead. . .
Me: (to the tune of row your boat) Roll, roll, roll the ball gently down the. . . stream!?? T: NO, momma. *sings* Gently down the . . . outside place on grass! Me: *giggle* We have a word for that. Its called a lawn. T: NO mom. The words are called outside place on grass! Me: Well you would know. Two-year-olds know EVERYTHING! Why yes, two year olds do know EVERYTHING– just wait until she is 12!! Mmmmmmm…. 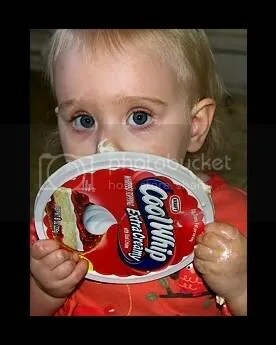 the CoolWhip looks delicious! Just lets not let her turn into the Cookie Monster! haha I’m loving the shades T their great! upside down and all. and leaf-ing I deffently think its part of the weather. Its great! A list to be cherished!! Cool Whip is always so much fun!!! T’s Thanksfull list is supperb!!! he he he…I agree a 2 years old knows everything…. 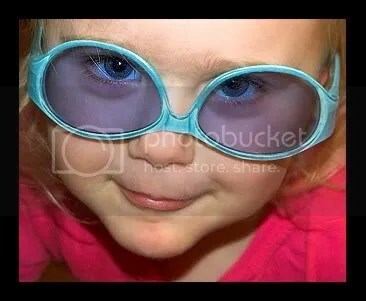 That’s my fabulously clever grandbaby-girl for you! She’s soooo impressive – whatever she says!